We started with our focus fabric and then selected our darks, lights and medium values from our fabrics. We fussy cut 18 patches at 6- 1/2 inch size. We then made 17 PUSS IN THE CORNER blocks, again 6- 1/2 inch in size ( 6 inch finished.) I think that is a silly name for a block and I can not imagine how it came about. We made 164 half square triangles from which we made flying geese units from. These finished at 3inch high and 6 inches across. These units sometimes surrounded the 6-1/ 2 inch blocks … I was able to see 12 different setting for these units. I will be posting more pictures with sample lay outs this week. These pictures will go along with my podcast whic I hope to post some time this week. What is a Girl to do when it snows? 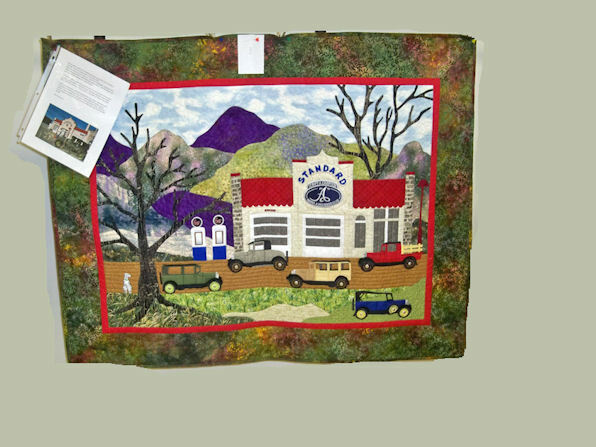 She does what any sensible WOMAN would do, she QUILTS. 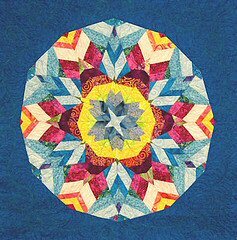 But today is the day of my Mystery Class at Elaine’s Quilty Shop in Hadley MI. there were things I had to do to get ready… like load the car with my sewing machine… Thank goodness , for garages. I do not plow the drive we have a guy come with a snow plow, so hopefully it will be done by the time I get home. I back up into the turn around and headed out. In order to set up my “ painter tape seam guide” I got out one of my favorite tools the Perfect Piecing Seam Guide / for scant 1/ 4 inch seam. This little guide will help you set up your painter tapes seam allowance guide. You hand turn your needle until it goes through the little hole in the yellow plastic. YOU then line up your painter’s tape so that extends down your table or support. This allows you to feed your fabric through and maintain a straight seam. This is helpful to me since I have some nerve issues in my dominate hand. This really helps when you cannot move your needle to the right or left on a basic/ class machine. I also like using the “LITTLE FOOT” as my machine foot. Presencia Thread 60 weight / 3 ply is my favorite piecing thread. I love the 60 weight / 3 ply thread because it is VERY STRONG but thin enough not to add bulk to the seam allowance. This weight and ply of thread is recommended by Harriet Hargraves in her Quilt Academy series of books. I am finding that this thread works really well at helping me sew accurate size blocks. The second technique that I use to maintain a SCANT quarter inch is to move my needle on my ‘GOOD’ machine to the right one notch. I use the standard quarter inch foot that comes with my machine. 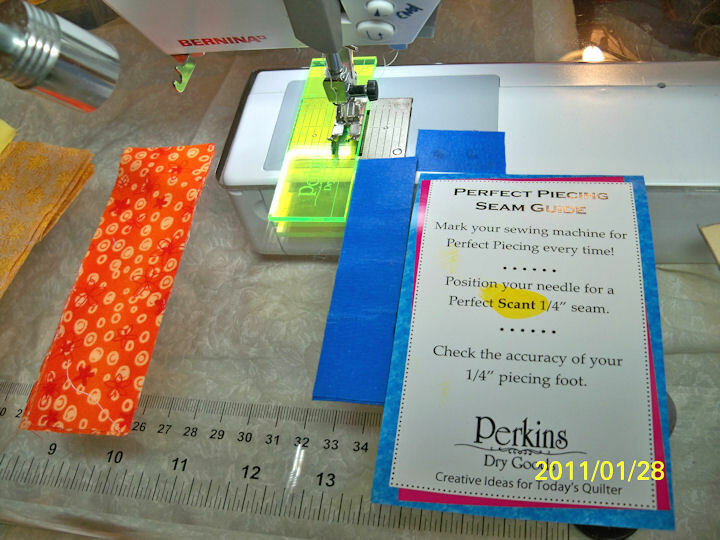 I frequently set up the painter’s tape seam guide, when I plan to sew a lot of patches together. It helps a lot. I know this is basic stuff to a lot of people but I think the basic are important to review. I lot of newbies need these tips. The reason I go through all the trouble of setting up a scant quarter inch for patchwork, is I get more consistently accurate finished blocks. My blocks now measure what they are suppose to measure. A 12-1 / 2 inch block measures 12-1 / 2 inches. It makes my life / my quilting so much less stressful. It is time for me to go and podcast. I think I have a good one in my soul since I just finished that Mystery class. …. So stay tuned. Unfortunately the internet is very slllllllllllow this morning, do not know why. May have something to do with excessive downloads / over our fair use limits…… So I am spending the morning sewing. Such a hardship. Plan to upload my pictures when my internet speed is back to normal. Our guest speaker this month was Sherrie Jaqua. 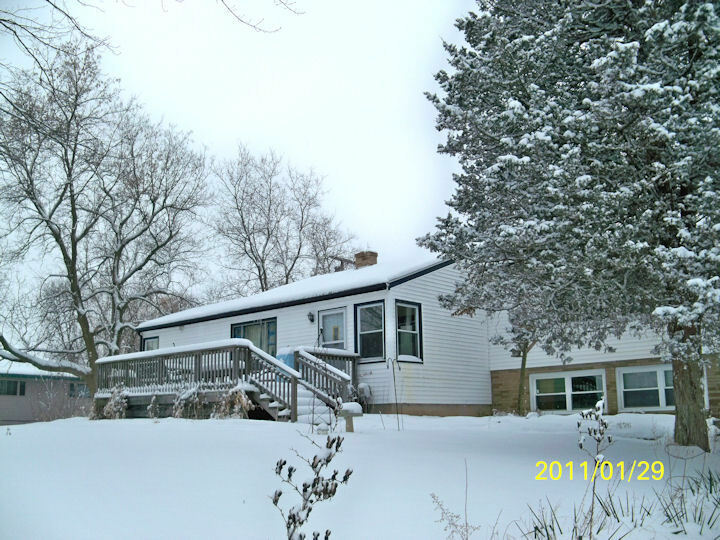 She is a quilt shop owner from Oscoda Mi. I did not hear and have not read the name of her quilt shop. She gave out directions to her shop but a person knew where her shop was. I have never been in the Oscoda and I would not have found her shop from her directions. I would provide a link to a web site but I did not have any. Usually I can find information on the internet but I did not this time. Sherrie’s lecture was titled, “THE FABRIC MADE ME DO IT!” When I had read the preview of her lecture in the newsletter, I thought to myself here is a kindred spirit. I thought, here was a lady who understood fabric and would not think I was crazy for wanting to listen to my fabric. Best still she is a quilt shop owner and she would have lots of fabrics. I settled in to see what marvels I was going to be shown. 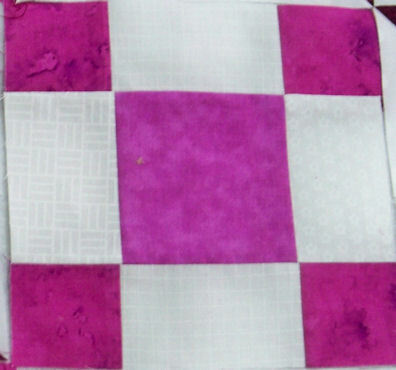 Her quilting experience dates back to when she made her first quilt 37 years ago. 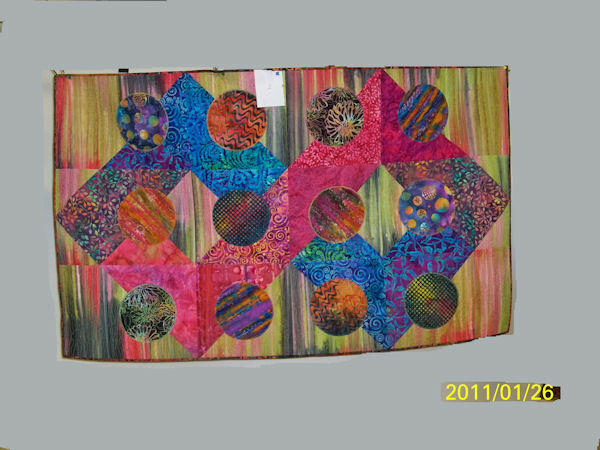 Sherrie showed us 50 quilts she and her cohorts have made this past five year as shop samples. Sherrie said she designed many of the patterns herself (She had self published patterns, TIME TO SHINE PATTERN COMPANY, available for sale.) and also made / had quilts made using the free patterns from the fabric companies. Unfortunately, Sherrie did not allow us to take pictures of her quilts so I have no pictures to show. 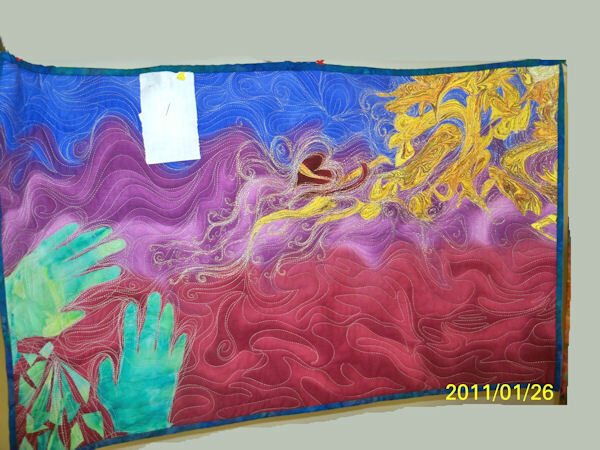 What I do have to show are pictures from the ART QUILT CHALLENGE. The guidelines/rules were simple, use any technique, medium, embellishment as art is subjective. Only stipulation must be larger than 15 by 15 inches. I will post the pictures and you select which ones you like best, then I will tell you the winners and a story next pod cast. The guild voted, now it is your turn to vote…. but I think they are all winners. IS THIS A FUTURE QUILTER IN THE MAKING??? It is my own fault and it could have been a heck of a lot worse. I should know better but I was in a hurry trying to multi task and get several things done at the same time, cooking dinner, washing dishes and a load of laundry done. I had my art quilt project out as I was planning to work on it after dinner. My grandson was playing on the kitchen floor with his cars, but we had been finger painting earlier in the afternoon. I had left the paints in a box but my grandson found the box and painted on my project while I was in the basement doing a load of laundry. I tried to salvage the project but it is beyond redemption. The art project was not going well so I really did not care it got ruined. My grand vision was a STINKER. He did not paint my floral hip to bee square quilt which was on the design wall. 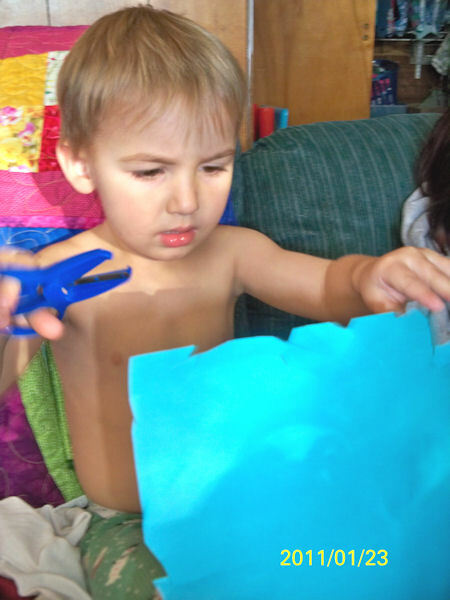 My grandson did not eat the paints… which he has done in the past when left unsupervised for a few minutes. No evidence eating. Three year old boys are not to be trusted. My project was simple fused flower based on pictures I have taken of my spring garden. It was kind of flat and uninteresting looking but I had not gotten to the embellishing part of the project. The art project is toast now I have to come up with a new project by Wednesday. I am calling this the quilt from HEXX because of my own stupidity. I have been messing around with this but I plan to continue till it is completed. 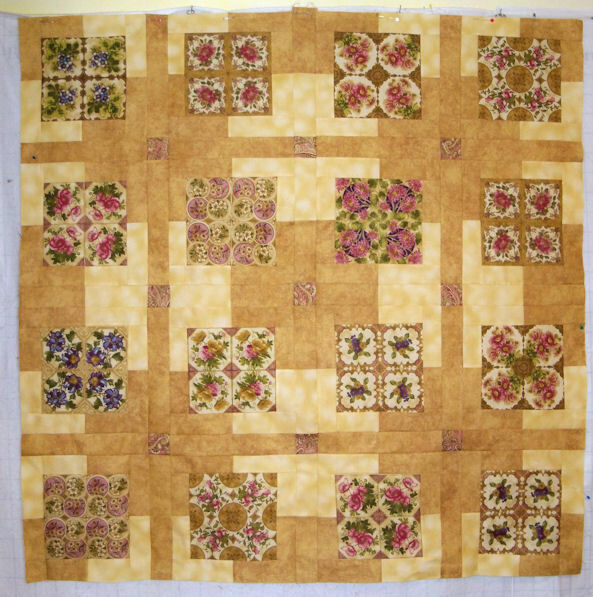 I am taking a quick break then I plan to sew at least two more blocks together, tonight. Playing with my quilt on the design wall. 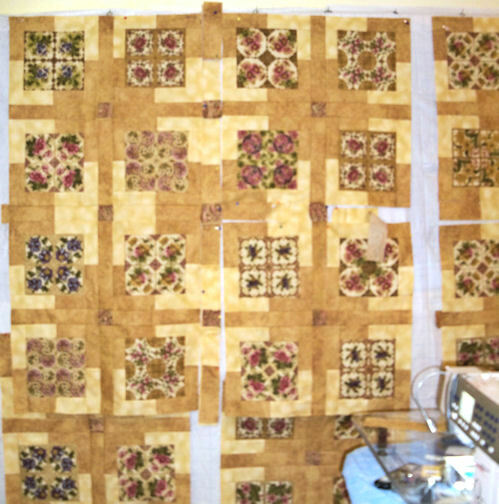 I have been working on my quilt for a couple of hours…. 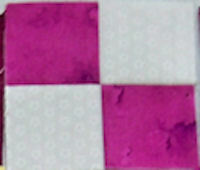 I have only sewn two blocks together. The rest of the time I have been trying to find a pleasing design and playing with different design options including introducing an additional fabric (nice brown.) That option lasted for only a short period because it changed the whole character of the quilt. It is an interesting option but not for this quilt. I have taken several pictures and decided this is the best option considering I have just enough fabric to piece the quilt. Some of the sections might end having an extra seam, but oh well. 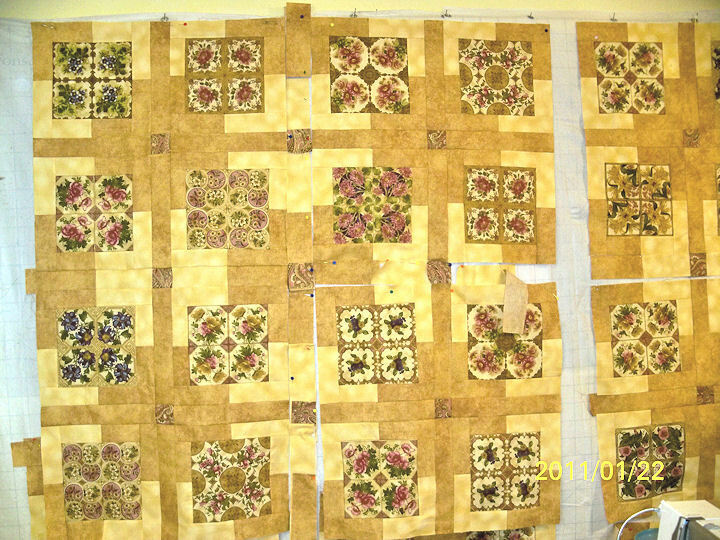 I am liking, the grid effect that is being achieved by the dark golden fabric, that was evident in the original pattern. Because of the change in the pattern due the fabric cutting mistake a whole new but pleasing design is evolving. I spent the last three hours putting together FOUR BLOCKS. Each block measures 26. 5 inches in size. I had to measure each piece of sashing individually to get it to align correctly. I have FIVE more blocks to assmble and add to the quilt. I do think it is going together better then I though it would. I want to have it finished by the end of the month. I estimate another 6 to 8 hours until I am able to sew on the sashing. 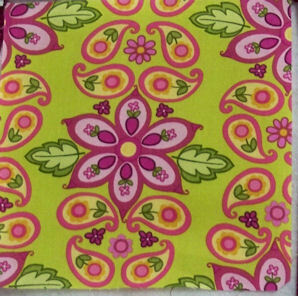 I have a lovely paisley fabric for the border from the same collection as the flower fabric. I will keep you updated. Nonnie’s Hot and Sour Soup ! ! Not quilting, but if I feed my family they let me quilt ! ! ! When I make soup it makes everyone feel warm and toasty. This one is a family favorite. 1/ 4 cup dried fungus ………..
Soak in hot water in separate bowls over night. Reconstitute then remove woody parts. Cut into fine julienne: 1/ 2 cup cooked pork or chicken. 1/2 cup each of bamboo shoots, water chestnuts. You can also add chopped scallions, leeks, celery, pea pods, broccoli, bean sprouts and your other favorite vegetables. If you are desperate add canned Chinese or Chop Suey vegetables. I also add chopped assorted types of fresh mushrooms. Slice thin firm tofu. IN a cup of chicken broth add of 2 Tablespoon cornstarch, set aside. If you want the soup spicier add more soy sauce, and vinegar. I have also been known to add a couple of tablespoons of MAGGI SWEET GARLIC CHILI SAUCE. This is a great soup to take to a party. My grandson won’t eat it but then he never wants to eat anything. WARNING: This is the original base recipe I modify it by what I have in the house. I often double the recipe. I often add leftovers.. ie rice or Thai noodles. It makes the soup more substantial. The flavoring are modified / increased according to taste. My food never tastes the same way twice… good but different.